This article submitted by Linda Stelling on 3/8/00. Paynesville hosted the Region 5 Future Leaders of America mid-winter meeting on Friday. About 21 schools with 350 students took part in various activities. Theme for the mid-winter meeting was "Working Together Youth Hold the Power." Members attending had the opportunity to give an illustrated S.T.A.R. event. Star stands for Students Taking Action with Recognition. S.T.A.R. events give the students a chance to show a panel of judges the different projects their chapter has been involved in and be judged on their presentation. All the S.T.A.R. events who received a gold will advance to the state meeting on April 27 to 29 at the Radisson South Hotel in Bloomington. 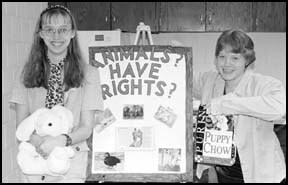 Competing were Amanda Reeck who received a gold on her respect event; Cheryl Guenther and Amy Schoenherr (pictured at right) who received a gold on their animal rights project; and the parlimentary team received a silver award. Members of the team are: Jesse Neu, Nathan Brown, Amy Schoenherr, and Amanda Reeck. Reeck was the outgoing region treasurer. New officers were elected for the coming year. Paynesville did not have any candidates. The S.T.A.R. event coordinators were Karen Odberg, Paynesville, and Carol Johnson, Hancock. The FLA members attending took a survey on changing their name to FCCLA, Family, Career, and Community Leaders of America. The name was changed at the national level in July 1999. Minnesota will use FLA affiliated with FCCLA, as the state name.